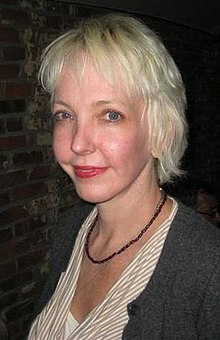 Jane Hamsher (born Jane Murphy; July 25, 1959) is a US film producer, author, and blogger best known as the author of Killer Instinct, a memoir about co-producing the 1994 movie Natural Born Killers with Don Murphy and others, and as the founder and publisher of the politically progressive blog FireDogLake (2004 – 2015). With Murphy, she also co-produced the subsequent films Apt Pupil (1998), Permanent Midnight (1998), and From Hell (2001). A contributor to The Huffington Post, she posts also in liberal Websites and political magazines, such as AlterNet and The American Prospect. Hamsher is a Massachusetts native who lived in Fitchburg and then Attleboro. Her family moved to Seattle when she was eight years old. She attended Roosevelt High School. She went on to attend Mills College in Oakland, California, and studied abroad in London. In college Hamsher worked as a reporter covering punk rock and politics for the San Francisco Bay Guardian. She also edited Damage, a punk rock fanzine. After college she moved to Los Angeles, where she was accepted into the Peter Stark Producing Program at the USC School of Cinema-Television. She received her M.F.A. in 1988. Hamsher lived in the Los Angeles area for most of her career as a producer. She sold her Nichols Canyon house in 2004 and moved to Otter Rock, Oregon. When she became interested in the 2006 Connecticut Senate race, she rented a small farmhouse in Guilford, Connecticut, where she and other bloggers and reporters could live while covering the campaign. A few months later she raised money for a similar rental in Washington, D.C., called "Plame House", which served as a base for covering the Scooter Libby trial. She now has a residence in Washington, D.C.
Hamsher has had breast cancer three times: 1993, 2004, and 2006. She insisted on returning to Washington, D.C., two weeks after her third surgery to blog the remainder of the Scooter Libby trial. Her treatment has been at St. John's Health Center in Santa Monica, California. Hamsher took her mother's maiden name. Her family name is Murphy. In 2009, Hamsher told Politico that she dated then-SEIU President Andy Stern for two years. She lives with her poodles Katie and Lucy. When Kobe, her third, died in 2009 she wrote a 5,000-word tribute. At USC, Hamsher became friends with Don Murphy, forming a production company, Jane and Don Productions, Inc. For $10,000, they secured an option on the original screenplay for the 1994 satirical crime film Natural Born Killers, written by a then-unknown Quentin Tarantino. However, "the film, directed by Oliver Stone, departed significantly from Tarantino's original screenplay, so much so that Tarantino removed his name from the screenplay credits." The film starred Woody Harrelson, Juliette Lewis, Tom Sizemore, Rodney Dangerfield, Robert Downey, Jr., and Tommy Lee Jones. It was co-produced with Thom Mount and Arnon Milchan, and its credited screenwriters included Stone, Dave Veloz, and Richard Rutowski. In addition to co-producing the film, Hamsher also had an uncredited cameo in it as a female demon. Subsequently, Hamsher and Murphy also co-produced two 1998 films, including Brandon Boyce's screen adaptation Apt Pupil, from the Stephen King novella, directed by Bryan Singer and starring Ian McKellen, Brad Renfro, and David Schwimmer, and Permanent Midnight, adapted by Jerry Stahl and David Veloz from Stahl's autobiographical novel and starring Ben Stiller, Maria Bello, and Elizabeth Hurley; and the 2001 thriller From Hell, based on Terry Hayes and Rafael Yglesias' adaptation of the graphic novel From Hell, by Alan Moore and Eddie Campbell, directed by the Hughes Brothers, and starring Johnny Depp, Heather Graham, Ian Holm, Robbie Coltrane, Ian Richardson, and Jason Flemyng. Hamsher also produced or co-produced the 1990 dramatic feature film An American Summer and the 1994 live-action film adaptation Double Dragon, based on Double Dragon, a video game franchise. In September 1997, Hamsher published the controversial memoir Killer Instinct recounting her experiences as a producer of Natural Born Killers. The L.A. Times said the book is "chock-full of outrageous firsthand tales." As Entertainment Weekly put it, "Stone is painted as a hard-partying womanizer who pits his underlings against each other and plays mind games....Tarantino gets off less easily. Hamsher charges that he betrayed her and Murphy by going behind their backs to keep them from making Natural Born Killers. She also calls Tarantino a 'one-trick pony,' a wildly overrated director." Hamsher included a full-page reproduction of a suggestive note Tarantino allegedly sent her at the Venice Film Festival. On his website, Murphy says that when Tarantino's former manager, Cathryn Jaymes, "came back with her notes [on the manuscript] my then partner lost it on her, I guess because she didn't want to make changes. There are many reasons why our partnership ended soon after that book, but her treatment of Cathryn was a major factor." Killer Instinct reached number two on the L.A. Times bestseller list. Hamsher was later sued by an attorney who is described in the book as a "creepazoid attorney," "the Kmart Johnnie Cochran" and "a loser wannabe lawyer." The Appeals Court affirmed that colorful language which does not impugn professional abilities is protected by the First Amendment." She has been involved with the political action groups Public Option Please, Blue America, Accountability Now and FDL Action. Hamsher has been a guest on Fox News, CNN, MSNBC, PBS, the BBC, and Al Jazeera. On April 7, 2008, she was a guest speaker in the panel discussion entitled "Intelligentsia" co-hosted by Elle and OfficeMax, along with Publisher of Elle Magazine Carol Smith, actress Melora Hardin, Vice President of Marketing for OfficeMax Julie Krueger, Editor in Chief of Elle Magazine Roberta Myers, footwear designer Taryn Rose, and Creative Director of Barneys Simon Dunan, at the Plaza Hotel, in New York City. Among other blogger conference programs, she participated in the South by Southwest (SXSW) Interactive Panels, held in Austin, Texas, from March 9 to 13, 2007, in which she also moderated Dan Rather's "Keynote Interview" event on Monday, March 12, and in the panel on "Political Blogging: Macaca Mania" at the BlogWorld & New Media Expo 2008, in Las Vegas, Nevada, on September 20, 2008. Hamsher, Jane. Killer Instinct: How Two Young Producers Took On Hollywood and Made the Most Controversial Film of the Decade. New York: Broadway Books, 1997. ISBN 0-7679-0074-X (10). ISBN 978-0-7679-0074-4 (13). ISBN 0-553-06914-4 (10). ISBN 978-0-553-06914-3 (13). ^ a b Pamela Murphy Farr; Jane Hamsher (June 24, 2006). "Greta Hamsher Murphy, 1924–2006" (Blog). Firedoglake. Jane Hamsher. Retrieved May 18, 2010. ^ a b Loren Farr; Jane Hamsher (July 23, 2005). "Happy birthday to you happy birthday..." (Blog). Firedoglake. Jane Hamsher. Retrieved May 18, 2010. ^ a b Jane Hamsher (August 27, 2009). "Remembering Ted Kennedy: How a 1968 Speech Comforted an 8 Year-Old" (Blog). FireDogLake. Jane Hamsher. Retrieved May 14, 2010. ^ a b Jane Hamsher (February 6, 2005). "How to Make the Superbowl (sic) Interesting for the Football Challenged" (Blog). FireDogLake. Jane Hamsher. Retrieved May 14, 2010. ^ a b c d Jane Hamsher (November 26, 2009). "I'm Thankful For Kobe – And You" (Blog). Firedoglake. Jane Hamsher. Retrieved May 18, 2010. ^ a b Hamsher, Jane; Douglas Tuber (1988). A proposal for the production and marketing of a theatrical motion picture entitled, Kenneth the first (M.F.A. thesis). University of Southern California. OCLC 51466744. Retrieved May 15, 2010. ^ a b c Paul Bass (July 4, 2006). "Jane & Her Poodles Get the Story". New Haven Independent. Retrieved November 16, 2008. ^ Tony Romm (December 23, 2009). "Republican Sen. Hatch cites liberal blogger in healthcare speech". The Hill. Retrieved May 26, 2010. ^ a b c Dana Kennedy (September 19, 1997). "Book Review: Killer Instinct". Entertainment Weekly. Retrieved November 17, 2008. ^ a b c Jane Hamsher. "Jane Hamsher". The Campaign Silo: FireDogLake. Jane Hamsher. Archived from the original (Blog) on November 23, 2008. Retrieved November 14, 2008. ^ a b "Jane Hamsher – Filmography – Movies & TV" (Website). The New York Times. Retrieved June 26, 2010. ^ Jane Hamsher (December 23, 2005). "Meme of Fours" (Blog). FireDogLake. Jane Hamsher. Retrieved May 14, 2010. ^ Jane Hamsher (June 15, 2005). "We Teach 'Em, You Kill 'Em? Mmm…Not So Fast" (Blog). FireDogLake. Jane Hamsher. Retrieved May 14, 2010. ^ Jane Hamsher (December 28, 2004). "Susan Sontag: 1933–2004" (Blog). FireDogLake. Jane Hamsher. Retrieved May 14, 2010. ^ Jane Hamsher (July 7, 2005). "BushCo: Blowing Covers is Our Business" (Blog). FireDogLake. Jane Hamsher. Retrieved May 15, 2010. ^ Paul Cullum (November 21, 2002). "The Misfits: Four killer producers on the cutting edge of independent film". LA Weekly. Retrieved May 15, 2010. ^ Jane Hamsher (December 20, 2005). "On Image: Part Two" (Blog). FireDogLake. Jane Hamsher. Retrieved May 20, 2010. ^ Jane Hamsher (December 13, 2008). "FDL DVD Salon Welcomes Ed Begley, Jr" (Blog). Firedoglake. Jane Hamsher. Retrieved June 26, 2010. ^ Jane Hamsher (February 22, 2007). "About Plame House..." (Blog). Firedoglake. Jane Hamsher. Retrieved May 18, 2010. ^ Jane Hamsher (July 16, 2009). "Diane (sic) Feinstein's Office: "Under No Circumstances Will We Meet With Jane Hamsher"" (Blog). FireDogLake. Jane Hamsher. Retrieved May 26, 2010. ^ Jane Hamsher (July 14, 2007). "Saturday Block Party: Weekend Obsessions and Guilty Pleasures" (Blog). FireDogLake. Jane Hamsher. Retrieved May 26, 2010. ^ Jane Hamsher (January 16, 2007). "Three Time Loser Winner" (Blog). FireDogLake. Jane Hamsher. Retrieved November 16, 2008. ^ Arianna Huffington (January 7, 2007). "Report from the ICU" (Blog). The Huffington Post. Arianna Huffington. Retrieved November 16, 2008. ^ Ben Smith (December 2, 2009). "Jane Hamsher leads left away from White House" (Blog). Politico. Allbritton Communications. Retrieved May 18, 2010. ^ a b Patrick Goldstein (September 10, 1997). "A 'Killer' Memoir". Los Angeles Times. Retrieved June 26, 2010. ^ Don Murphy (January 8, 2010). "Cathryn Jaymes, a Classy Lady" (Blog). Don Murphy. Don Murphy. Retrieved June 26, 2010. ^ Times poll of Southland bookstores (September 28, 1997). "Bestsellers". Los Angeles Times. Retrieved June 26, 2010. ^ Ann W. O'Neill (September 26, 1999). "Judge Judy Takes Control, Even as a Witness". Los Angeles Times. Retrieved June 26, 2010. ^ P.J. Boren (September 20, 1999). "Ferlauto v. Hamsher (1999) 74 CA4th 1394". California Courts of Appeal, Second District. Retrieved June 26, 2010. ^ "Company Bankruptcy Information for Common Sense Media, LLC". business-bankruptcies.com. Retrieved March 25, 2013. ^ a b "Jane Hamsher: Political Blogging: Macaca Mania". Eventcosm.com. Blogcosm. September 20, 2008. Archived from the original on September 24, 2008. Retrieved November 16, 2008. McIntire, Mike; Jennifer Medina (August 4, 2006). "In Race, Bloggers Throw Curves and Spitballs". The New York Times. The New York Times Company. Retrieved November 15, 2008. FireDogLake – Blog founded and published by Jane Hamsher. 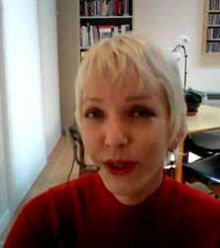 "Hamsher, Jane" – Index of video interviews and diavlogcasts with Jane Hamsher on Bloggingheads.tv. "Jane Hamsher" – Biography and index of blog posts at The Huffington Post. Jane Hamsher on IMDb . "Jane Hamsher: Author Spotlight" at Random House. "Jane Hamsher: Publisher, The Fire Dog Lake Company" – Panel speaker profile in "South by Southwest 2007 Interactive Panels Schedule," Austin, Texas, March 9–13, 2007.